. . . and by “Potter” I am of course referring to Beatrix, not . . . you know. Peter gave himself up for lost, and shed big tears; but his sobs were overheard by some friendly sparrows, who flew to him in great excitement, and implored him to exert himself. It’s also one of the few Potter books that I have a strong memory of being read to by my mother. I still remember dutifully repeating the Moral of the Story afterwards to her, and feeling awfully lucky that I wasn’t as naughty as poor Peter. There’s something to be said for that little feeling of smugness that comes with a book wherein the protagonist is far, far dumber than you are. Let’s start with the pie, shall we? I love how specific Mother Rabbit is with her warning: not to stay away from Mr. McGregor’s garden because of “danger” or “Because I Told You To,” but because “your father had an accident there; he was put into a pie by Mrs. McGregor.” And yet — “accident.” As if — whoops! — Mrs. McGregor mixed up her bunnies and cherries and put Father Rabbit in a pie by mistake. Silly misunderstanding, that. 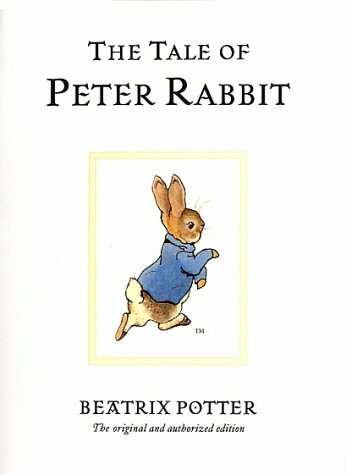 Peter, one of the great dim bulbs of children’s literature, runs off to the garden the second Ma makes for the bakery (oh, how I love the way his jacket turns up at the edges when he ignores his mum!). He then proceeds to stuff his bunny belly until he is sick, setting an odd custom in the Potter books — characters who eat lots of vegetables almost always end up getting sick. Alert the pediatric nutritionists, if you will. Then — the exciting part of the book! Mr. McGregor pops up from behind a cucumber frame and proceeds to chase our hero until he’s in naught but his nuddy-pants, but then — just gives up. No, he doesn’t fall down a cliff like a Disney villain, or get outwitted by Peter, he’s just “tired of running after Peter” and goes back to his work. It’s here that I really notice what makes the Potter books different from other stories with anthropomorphized animals — although they walk, talk, and wear clothes, humans and animals tend to have the same kinds of relationships as they would in the real world — that of hunter/prey, or bandit/gardener, in this case. Mr. McGregor responds to Peter in the way that any middle-aged gardener would — he chases him for a while, then gives up — and Peter is very bunnyish in that he spends most of the book randomly running around scared without any sense of direction. It’s that lack of direction that makes the middle of this story sag a bit; Peter runs in random circles around the garden before finding his way out (again, not through wit or cleverness, but by randomly passing the gate through which he came in). Every kid I’ve read this story to tends to get bored during this part. But perhaps Edwardian children knew more about the various pitfalls lurking in an English kitchen garden. Beware the white cat! Look out for that gooseberry net! The SIEVE! Stay away from the SIEVE!!! Finally, Peter escapes, his clothes are scarecrow-ed, and once at home he is punished with — oh no . . . I can’t even type it! Camomile tea. Nooooo! Er, well . . . I suppose I’d yell “noooo!” if I’d ever drunk camomile tea. Again, this is something that I think the children of 1902 would appreciate more than the kids of today. Except maybe the children of hippie herbal tea enthusiasts. 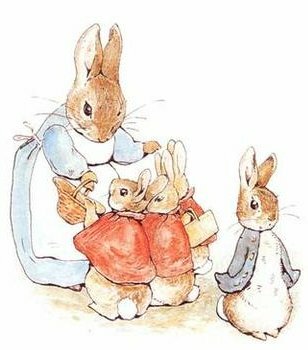 However, every kid, Edwardian or not, can appreciate the good bunnies’ reward: “Flopsy, Mopsy, and Cotton-tail had bread and milk and blackberries for supper.” That’s good eatin’, folks. New Feature! Get Yer Shiny New Feature, Here! An Announcement . . .